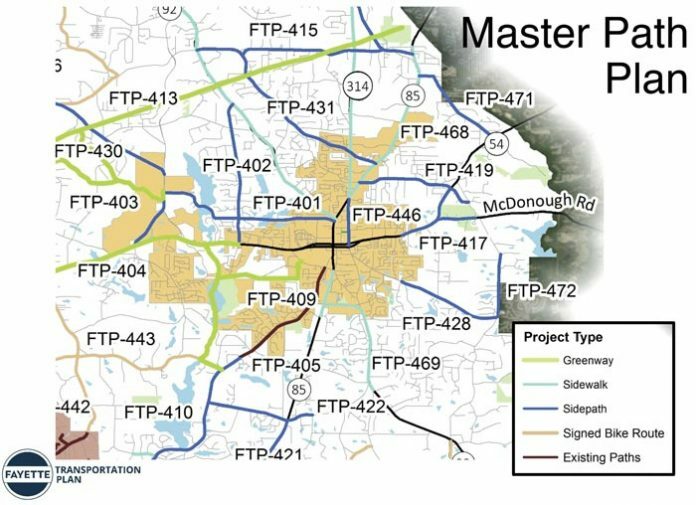 A conceptual rendering of the Fayette County Master Path Plan, specifically geared to the Fayetteville area, was presented Oct. 18 before the Fayetteville City Council. Graphic/Fayetteville. As with other municipalities across Fayette County and the county government, draft plans for the Fayette County Transportation Plan (CTP) and Master Path Plan were presented at the Oct. 18 meeting of the Fayetteville City Council. The plans are expected to be adopted in early 2019. Information on the plans was presented by Michael Kray, senior transportation planner with Atlanta-based planning firm Jacobs, who noted that considerations are being made for traffic congestion as of 2040. Countywide, community input on the draft CTP and Master Path Plan was given at events at four community events across the county, at open house events attended by more than 400 residents and by surveys that received more than 1,300 responses. The draft CTP looked at existing roadways, with a view to future corridor improvements and areas where roads could be widened to meet coming traffic demands. In the Fayetteville area and beyond, road widening projects and corridor improvements could be considered for roadways such as Tyrone Road, Ga. Highway 92 north and south of the city, McDonough Road, Hood Road, Jeff Davis Drive, Ga. Highway 314 and the existing two-lane portion of Ga. Highway 85 on Fayetteville’s south side. Kray noted that a number of roadway improvements were previously identified in the county’s 2010 transportation plan. Kray said future plans could examine linking Bernhard Road to Goza Road with a new road segment on the east side of the county linking to Clayton and Henry counties, essentially providing options for east/west travel. A possible project that includes both roadway and path components would be the reconstruction of the bridge on Hood Road over Whitewater Creek. The project could include joining Hood Road with Hood Avenue and adding a path crossing that could link central and west Fayetteville on the city’s northwest side. Commenting on the Hood Road project, City Manager Ray Gibson said plans include having the bridge and roadway built over the next 10-15 years. Pertaining to the draft Master Path Plan, Kray said the idea is to consider expanding the current path system, with an emphasis on safety and amenities. Potential path projects throughout Fayette and in and around Fayetteville include pedestrian paths like those already existing in portions of Fayette, along with greenway trails, signed bike routes and sidewalks. Sidewalks could be installed along portions of highways 85, 92 and 314. Path or greenway projects could be planned for Hwy. 54 to Peachtree City, Sandy Creek Road, Ginger Cake Road and New Hope Road. Another aspect of the overall transportation and path plan for the Fayetteville area could include a number of intersection improvements. Gibson after the presentation said city staff will talk with council members to receive comments and suggestions. 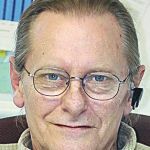 Fayette County Public Works Director Phil Mallon at the Oct. 12 meeting at the Fayette County Library said he hopes the upcoming presentations will generate discussion and comments throughout the community. Mallon said the goal is to have the final plans ready by the end of 2018, then to return the plans to the various jurisdictions for approval in early 2019.